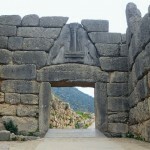 Highlights: Do not miss this rare and unique opportunity to visit in one day the 3.500 years old ruins of the astonishing Mycenaic civilization together with a beautiful and very picturesque Greek island of the Saronic Golf. After a short stop at the Corinth Canal we arrive in Mycenae, the Homeric City of Atreides, and visit the archaeological site. We continue driving on for the seaside village of Galatas; from there a small ferry boat will take us in a few minutes to the island of Poros. There will be free time for strolling in the beautiful promenade and we'll have lunch by the seaside at a Greek traditional taverna. Early afternoon departure for Athens.